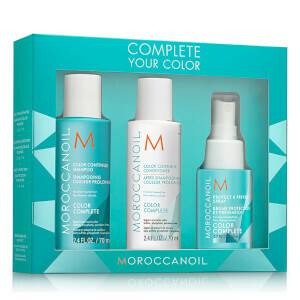 Extend the vibrant longevity of your hair colour between salon appointments with the Moroccanoil Colour Continue Shampoo; a revolutionary 360° approach to colour care that starts in the salon and is maintained at home. Designed to extend the results of the in-salon ChromaTech Service, Colour Continue Shampoo helps improve colour retention by restoring hair health. 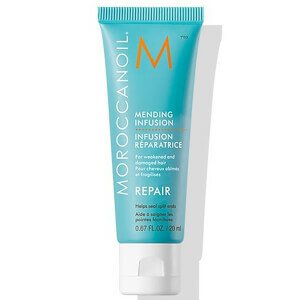 Enriched with COLORLINK™, Moroccanoil’s ground-breaking technology that repairs and nourishes each individual strand from root to tip, the colour-restorative cleanser leaves locks shinier, glossier and more vibrant in colour, depth and dimension. 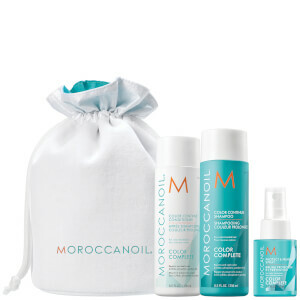 Massage Color Continue Shampoo through wet hair and scalp. Because Color Continue Shampoo is a specialty low-pH cleanser, foaming will be minimal. To activate a richer lather, add more water. Rinse the hair thoroughly and repeat if needed. 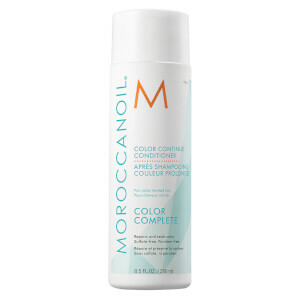 For optimal results, use with Color Continue Conditioner and the rest of the Color Complete regimen. Aqua/Water/Eau, Sodium Cocoamphoacetate, Sodium Cocoyl Isethionate, Cocamidopropyl Betaine, Sodium Methyl Cocoyl Taurate, Cocamidopropyl Hydroxysultaine, Sodium Chloride, Decyl Glucoside, Acrylates/Aminoacrylates/C10-30 Alkyl Peg-20 Itaconate Copolymer, Lauryl Glucoside, Ppg-26-Buteth-26, Citric Acid, Parfum/Fragrance, Polyquaternium-113, Argania Spinosa (Argan) Kernel Oil, Carrageenan, Peg-40 Hydrogenated Castor Oil, Xanthan Gum, Glycerin, Silicone Quaternium-22, Hydroxyacetophenone, Caprylyl Glycol, Hydroxypropyl Gluconamide, Hydroxypropylammonium Gluconate, Dipropylene Glycol, Polyglyceryl-3 Caprate, Caprylic/Capric Triglyceride, Propylene Glycol, Trideceth-50, Algin, Coco-Glucoside, Palmitamidopropyltrimonium Chloride, Sorbitan Oleate, Chitosan, Guar Hydroxypropyltrimonium Chloride, Tartaric Acid, C12-13 Pareth-9, Sodium Lauroyl Lactylate, Ceramide Np, Ceramide Ap, Phytosphingosine, Cholesterol, Carbomer, Ethylhexylglycerin, Ceramide Eop, Benzyl Alcohol, Potassium Sorbate, Sodium Benzoate, Chlorphenesin, Phenoxyethanol, Alpha-Isomethyl Ionone, Linalool. Moccs01.